By: Yellowstone Gate | April 10, 2012 View as "Clean Read"
Ranger naturalists in Grand Teton National Park will lead early-morning tours this month to watch sage grouse during their annual courtship dance. Each spring, the birds engage in elaborate rituals aimed at helping them find a mate. Male sage grouse perform intricate displays known as “struts” in an attempt to attract females. The struts take place on leks, or mating grounds, and include subtle vocalizations and other highly specific behaviors. Successful males are able to mate with many females, while less dominate males typically mate with a small number of females, or none at all. So the competition is fierce in what amounts to one of Mother Nature’s intense dance contests. In May 2010, the U.S. 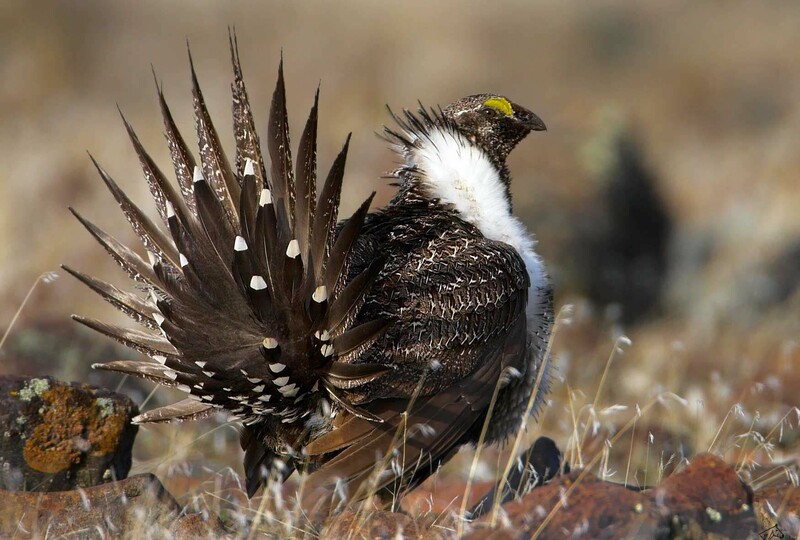 Fish and Wildlife Service found that the greater sage grouse could face extinction, and that it warranted protection under the Endangered Species Act. But the agency did not list the sage grouse as endangered, citing other species that had more urgent need of protection. The “warranted but precluded” status means the agency will continue to closely monitor the sage grouse, whose habitat around the greater Yellowstone area and across the mountain West has been greatly fragmented by development. The birds rely heavily throughout the year on sagebrush for roosting cover and food, including as a source of insects for newly hatched chicks. Grand Teton's strutting grouse tours are part of a series of special events planned during National Park Week, April 21-29. Grand Teton and the 396 other national park units across America will waive entrance fees in recognition of this special week. A seven-day pass to Yellowstone and Grand Teton National Park is normally $25 for a private vehicle. While tour participants view the antics of strutting grouse, rangers will provide information about their natural history and various conservation efforts underway for sage grouse populations that have declined throughout much of the American West. Free sage grouse tours begin from the Craig Thomas Discovery and Visitor Center in Moose, Wyo. at 5:30 a.m. and reservations are required. To make a reservation or for information on what to wear and bring along, call 307-739-3399. Spring is officially a few days away, but after a bearish winter, the first grizzly of the season has been spotted in Yellowstone National Park. Early Wednesday morning, March 15, a park employee observed a grizzly bear between Mammoth Hot Springs and Tower-Roosevelt, according to a statement released by the park's public affairs office. It is the first confirmed bear sighting this year, although bear tracks have been observed since February 22. Throughout the summer, thousands of visitors come to Yellowstone National Park to catch a glimpse of awe-inspiring predators like grizzly bears and gray wolves. But during the fall, there's a different group of apex predators who travel through Yellowstone in search of prey. They often strike without warning, and sometimes go unseen until the fatal moment. Migratory raptors like hawks are a familiar sight in the park at this time of year, and visitors have a rare chance to learn about raptors from an expert, while also helping track birds of prey as part of a citizen science effort that could inform management decisions in Yellowstone. In a move that had been widely expected, the U.S. Fish and Wildlife Service on Thursday proposed to remove federal protections for grizzly bears in the greater Yellowstone ecosystem. The agency called the restoration of the grizzly bear in Montana, Wyoming and Idaho over the last three decades "one of America’s great conservation successes." Some environmental groups have criticized the move, saying it prematurely drops protections for grizzlies. 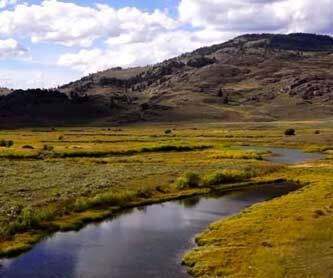 Residents around Yellowstone and Grand Teton national parks often fall into a rut of taking for granted the rare and amazing natural resources in their own backyards. So it's no surprise when a grizzly bear, gray wolf or bull moose serves as a reminder of how special it is to live at the doorstep of an iconic national park. But clouds? Apparently, clouds were a major attraction Thursday in Grand Teton National Park, as an unusual cloud formation put on a dazzling show that sent visitors and veteran National Park Service employees scrambling for cameras and staring skyward. I’m not sure how much walking is involved, so obviously, it would depend on the person walking and the distance. Sorry I don’t have details, but you can probably get very specific distance from the Craig Thomas Discovery and Visitor Center at 307-739-3399.